The Green Hairy Mushroom is so awesome, how could anyone not want one! The Green Hairy Mushroom is practically the staple of the Rhodactis genus. Everyone wants or has a Hairy Mushroom in their tank. Not only do they look spectacular, this mushroom coral is easy to care for, easy to find in a fish store or online, and inexpensive to purchase. The Rhodactis indosinensis has a surface that is covered with short, split-ended tentacles. They are arranged radially, thus giving them a fuzzy or hairy appearance. The various colors within their body including pink, brown, green and rust. These contrasting colors are found in the tentacles, tentacle tips, mouth and body color. The Green Hairy Mushrooms is pretty easy going. No matter what level of light you have. Low light, moderate light, or high intensity light, it is no problem for this guy. It will adjust to any lighting just by changing its location in the tank. As far as water movement, they prefer low water velocity, but will do okay in a moderate flow as well. The R. indosinensis are bred in captivity and they are very easy to propagate in any home aquaria, which can contribute to preserving the wild populations. Just keeping it well fed with small pieces of fish and crustaceans will cause the it to multiply quickly. Even after splitting, the clone mushroom at times doesn't always resemble the "mother" mushroom. Predators are unknown. Mushroom Coral Information: The Green Hairy Mushroom Rhodactis indosinensis was described by Carlgren in 1943. Some names they are known for are Hairy Mushroom, Elephant Ear Mushroom, Metallic Mushroom, Mushroom Anemone, and Hairy Mushroom Anemone. Where Mushroom Corals Are Found: The Rhodactis indosinensis are found in the Central Indo-Pacific Ocean. Mushroom Coral Habitat: These Hairy Mushrooms are found on reef slopes, reef shallows, bays, lagoons, and boat channels. They like to grow on dead corals, rubble, and between coral heads. They feed on fish and crustaceans by luring them into their partially closed "purse-string" like enclosures. Seeking what looks like good shelter, once the prey are inside, the Rhodactis will just close up and consume them. Larger particles are also trapped on the mucous laden hairy surface when fully open, and then consumed in the same manner. Predators are unknown. What do Mushroom Corals look like: These Coral Mushrooms Rhodactis indosinensis are basically a coral without a skeleton and their internal structures are the same as stony corals. The top of their body or the upper surface is called the oral disc. The stalk area, which is very small, is called the column and it is located just above the pedal disc, which is where they attach to surfaces. On their surface, they have short feeding tentacles to capture prey that hold several types of stinging cells. The R. indosinensis has a surface that is covered with short, split-ended tentacles that are called verrucae. They are arranged radially, thus giving them a fuzzy or hairy appearance. The various colors within their body include pink, brown, green and rust. These contrasting colors are found in the tentacles, tentacle tips, mouth and body color. Their marginal tentacles are quite long compared to the surface tentacles, and their oral disc also has several single small tentacles as well. There is a bare zone between the discal tentacles and the marginal or body surface tentacles. At times they will make a trumpet shape which is thought to be formed when needing nourishment or if the light level is low or low quality due to age. With this shape they have formed, fish will be fooled into taking shelter in that little "cave" only to become a meal for the mushroom. Mushroom Coral Life Cycles: The Green Hairy Mushroom can grow to 4 - 8" (10 - 20 cm), but their life span is unknown. Mushroom Coral Care: The Green Hairy Mushroom is easy to care for. This mushroom likes moderate to high levels of light, although in general high light is not a requirement. If the lighting is not their liking, they will fail to thrive and/or shrink. They can easily be brought back by changing their position in the water and by extra feedings. They also cannot handle too high a water flow, they can handle moderate but prefer low velocities. Mushroom Coral Feeding: The Green Hairy Mushroom is a carnivore. In the wild, these corallimorphs feed on fish and crustaceans by luring them into their partially closed "purse-string" like enclosures. Seeking what looks like good shelter, once inside, the Rhodactis will just close up and consume their prey. Larger particles are also trapped on the mucous laden hairy surface when fully open, as consumed in the same manner. Like most mushroom corals, they are also well equipped with nutritional alternatives for their well-being. They can derive nutrition from their symbiotic algae, zooxanthellae, that dwells within their tissues. They can also actually warp their surfaces to change the water flow over them to direct particulate and flocculent material toward their mucous center for absorption. In captivity you can feed your R. indosinensis small pieces of fish and crustacean flesh. They can also be fed pellet and flake, though these are not suggested on a regular basis. Feed as often as they will close up around the food and eat. The more your feed them, the faster they multiply if that is your aim. If the water is moderate, you may have to hold the food in place until the mushroom gets a chance to close around the food. Hold lightly and do not press into the mushroom. Water changes of 10% bi-monthly or 20% a month are typical. Provide a reef environment with proper magnesium levels. Some claim proper iodine levels are beneficial also. Due to their toxins, active carbon is a good idea with larger colonies of mushrooms. Do not over skim since the R. indosinensis need nutrients to survive on and will not do well in a pristine environment. A typical live rock/reef environment is what is needed for your Green Hairy Mushroom. Provide rubble or dead coral and live rock for them to have something with which to attach their pedal disc. They do not do well with strong water movement, so direct the power heads and intake nozzles away from them. As they can float around when looking for a place to settle, it's a good rule of thumb to have all of your pumps covered. Most good quality pumps have guards on them. The Green Hairy Mushroom is semi-aggressive if they are near another coral. They will cause other corals to loose tissue, recess possibly die. Acroporas will not grow in aquariums with large mushroom populations. Make sure to leave 6 - 8 " between your mushrooms and other corals. Watch the growth rate since the R. indosinensis will overgrow and kill any nearby corals. Slow moving fish and shrimp run a risk of being consumed by the R. indosinensis. At times, clown fish may adopt a Green Hairy Mushroom as a host, however these fish can irritate them. If the mushroom remains closed up and small, you must remove the fish to prevent further irritation. Just like anemones, the very large ones may tolerate a clownfish better than small ones. Mushroom Anemones will tolerate their own species and usually other Mushrooms. In the wild many species of Mushroom Corals occur together in large groups. In captivity R. indosinensis will get along with their own species, but may not tolerate mushroom species outside their colony. Even in one genus, if the color is different or a different species, the weaker mushroom will detach and find another location. Strong water movement will cause them to detach as well. The R. indosinensis are disease resistant, and only affected by improper husbandry. Problems for the most Corallimorphs are pretty minimal unless your lighting, water movement, feeding and water quality are improper for these animals. A sign of this is if your coral mushroom detaches to look for "better conditions" to settle in. They have very few predators if any. 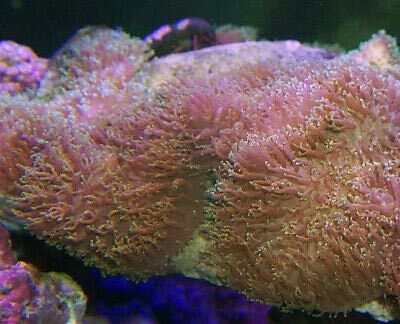 Mushroom Corals for Sale: The Green Hairy Mushroom, Hairy Mushroom, or Elephant Ear Mushroom R. indosinensis can be found easily online and at pet stores, as well as from frag farmers and most reef clubs. Online they start at about $36.00 USD and up, depending on the size of the rock they are sold on. Some may sell them individually as well.